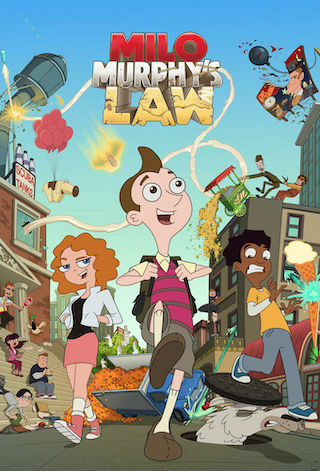 Milo Murphy's Law is an American 15 minute animation adventure television series, which kicked off on October 3, 2016, on Disney XD and is broadcast every Monday at 07:00. The show is currently in its 2nd season. Disney XD has officially confirmed the renewal of Milo Murphy's Law for Season 3. The exact release date is yet to be announced so far. Sign up to track it down. Season two of "Milo Murphy's Law" animated series debuts with a one-hour "Phineas and Ferb" crossover special SATURDAY, JAN. 5 (7:00-8:00 a.m. EST/PST), on both Disney Channel and Disney XD. The special, titled "The Phineas and Ferb Effect," will also be available that same day on DisneyNOW and Disney Channel VOD. News of the season two premiere date was included today in a satirical video podcast (available here) hosted by "Phineas and Ferb" fan-favorite Dr. Doofenshmirtz exclusively interviewing his first celebrity guest, Al Yankovic. "The Phineas and Ferb Effect" follows Milo and his friends, along with their newly discovered neighbors - Phineas, Ferb, Perry the Platypus, Candace, Isabella, Baljeet and Buford - as they work together to overcome Murphy's Law in order to stop a pistachio invasion."